With a little bit of hindsight, it’s so easy to see how a label paints a detailed picture of a music era. Over the last decade, Jazz has been completely re-shaped, somewhat in part by initiatives like Jazz re:freshed and Tomorrow’s Warriors. By giving platforms to young musicians like Nubya Garcia, Binker and Moses and Theon Cross, the UK has developed one of the youngest and most progressive Jazz scenes of the century – and select independent record labels have been helping these artists to be celebrated globally. A box of records from these eight imprints will provide a meaty time capsule for rediscovery in decades to come. Founded by Gilles Peterson, one of the UK’s most informed music aficionados, Brownswood Recordings have fearlessly been supporting rising talent from across the Jazz spectrum since 2006. Their distinctive curation has been at the centre of London’s Jazz scene, pinicled by their Internationally acclaimed compilation, ‘We Out Here’. Brownswood is sibling of sorts to Future Bubblers, releasing compilations and often individual records by graduates of the talent and development initiative. Thanks to Gilles’ curiosity for Cuban music, Brownswood also provides an excellent introduction to Caribbean flair; check out the Havana Cultura releases and vocalist Daymé Arocena. The multi-layered cross-section between hip-hop and Jazz is found in London based label First Word Records, founded by Aly Gillani; he’s also a member of Bandcamp’s International team, so you know his taste is impeccable. DJs like Eric Lau and Tall Black Guy find themselves at home on the label, whilst soulful duos Children of Zeus and Darkhouse Family sit alongside dreamy recordings from Yazmin Lacey in any upto date FWR collection. Gillani’s label provides the kind of beats that you want to float through. Having began as a weekly residency in West London, Jazz re:freshed has grown to become a movement which is recognised Internationally for championing London’s young risers; Nubya Garcia and Ashley Henry released their debut records on the brand’s imprint. You can even listen to one of these releases whilst wearing a Jazz re:freshed T-shirt and planning your next trip to their Mau Mau Bar residency. Having taken artists to perform in Brazil, SXSW and New York, Jazz re:freshed are so much more than a label. For a label that’s based near Reading, Edition have a very European outlook. With Danish double bassist Jasper Høiby, Denmark based Girls In Airports and Finnish quintet Oddarrang, it’s a widely Scandinavian imprint. Whilst this was never intended – label founder Dave Stapleton describes the signings as being “built on connections” – artists like Mercury nominated Dinosaur and Welsh group Slowly Rolling Camera give Edition a presence on home ground. Ten years after forming, Edition are your go-to for challenging, spacious and progressive Jazz – with a Scandi-twist. New York, Johannesburg, South London; history books will undeniably dedicate chapters to the genre-breaking scene South of the river, and if it’s done well, it will mention 22a. Founded by Ed “Tenderlonious” Cawthorne, the label have presented releases from Ruby Rushton, Reginald Omas Mamode IV and Dennis Ayler, documenting shuffling, groove-orientated South London post-swag strides. Based in King’s Cross, London, wax-centric Gearbox Records is the only label in our list that has designed their own record player. Their fascination with live recordings is another factor that makes Gearbox a distinctive label. Their discography is hugely varied but consistent given its Jazz core. In 2018 they’ve revealed live recordings from Thelonious Monk and Binker and Moses alongside Butcher Brown – whose Camden Session was laid down and cut in-house at Mark Ronson’s Zelig Studio. Gearbox are a label for music collectors who prefer to experience music in the flesh. Look out for Sarathy Korwar’s first activity for the imprint – a three disc interpretation of Jazz Standards, through an Indian-classical lens. Ten years old, Gondwana is the Northern soul in the UK’s scene. Its founder, trumpeter Matthew Halsall, has curated a multi-dimensional roster. Spiritual Jazz, from the likes of L.A. vocalist Dwight Trible and Halsall himself, sit at the label’s shapeshifting core as naturally as club-jazz groups Portico Quartet and GoGo Penguin (who are now signed to the legendary Blue Note). In its tenth year, Gondwana has begun inviting a neo-soul influence into its identity with Leeds four piece Noya Rao and their first Australian signing, 30/70 singer Allysha Joy. Celebrating its tenth birthday with live shows in London, Berlin and Tokyo (the label are ‘big in Japan’), Gondwana could go in many sonic directions for its next decade, with all of them making perfect sense. In a recent interview for Downbeat, Pete Buckenham shared that he may relocate On The Corner Records in response to Brexit – all the more reason for us to highlight the label before the European continent becomes its potential home. London based Collocutor, as well as Penya and Dengue Dengue Dengue represent On The Corner’s celebration of Internationalism, pushing textured sounds with multi-cultural influences and field recordings that are often suited equally between live venues and DJ sets. 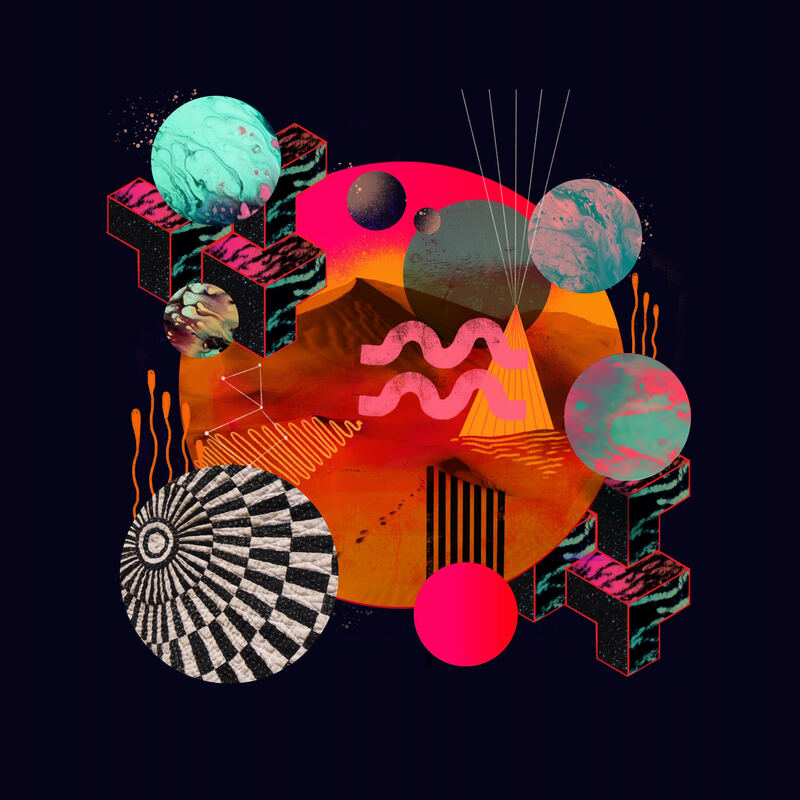 Their records are also visualised by the hugely talented illustrator Victoria Topping; the image above partners with their Planet Battagon release. You missed out Discus Music, who probably have the strongest catalogue of any British Jazz label at the moment, and the strongest artist roster.